Happy Thanksgiving! I hope your day is a safe and happy one. Anyway, I am Thankful to be here having a good time with family. And, this holiday reminds me that I don’t say often enough how thankful I am to ALL you Cozy Mystery blog readers. You ALL are who make this place come alive >>> THANK YOU. Don’t you love the weather here?! Of course, Happy T Day to you too! Hope on one of these trips you visit Little Washington in Rappahannock County and drive down 231 from Sperryville. Your daughter might enjoy hiking the famous Old Rag mountain, at the southern end of the county, accessible via that road. Enjoy relaxing without cooking. I am still busy with food prep for my family…one of these years we all will dine out. But you might laugh to know that the turkey is still frozen. I decided against fresh killed, free range that is so abundant around me. I gave in, bought a standard bird from the super market, frozen for safety purposes and then decided to get a smoked one from Honey Baked….ah, decisions, decisions. And late tonight I will prop up my feet and relax with a cozy….please let us know how your DC experience turns out….and thanks for thinking of all of us. Kim, Happy Thanksgiving to you, too! We just got back from eating an absolutely huge meal at the Founding Farmers restaurant. I decided, since I didn’t have to do any of the preparation to go the non traditional turkey route and got the pork tenderloin >>> which was very good. Huge portions! I wish we had a place like this down in San Antonio! I could really get used to not having the Thanksgiving day you describe! Yikes on the frozen turkey you have! The last few years I have gotten smoked frozen turkeys, which our daughter prefers. Of course, there’s always one person (in this instance my tech guy/husband) who doesn’t like the smoked taste, so I know about “decisions, decisions”! I’ll be sure to tell our daughter about Little Washington. She now has her car, so she will be able to take advantage of the hiking places around the D.C. area. Thanks! Happy Thanksgiving to you and all my fellow subscribers! Thanks for all of your hard work in making this blog such an informative and enjoyable resource! Kimberley, thank you! You ALL are the people who make this such a Cozy place! Have a fun day with your family. Sometimes unexpected experiences turn into traditions. Enjoy! Paula Catherine, anything that means not spending the whole day in the kitchen has my vote for changing the old traditions! Happy Thanksgiving! Enjoy your relaxing thanksgiving ! Tiffani, we had a lovely time eating out. It has been so relaxing >>> that my husband is currently asleep, and I have all this time to play at the computer. Thank you! I’m away from home this Thanksgiving, too, awaiting the birth of my first grandchild. This is also the first time in many years that I have not been busy in the kitchen–although I did enjoy that very much too. Danna, yours is one of the few blogs I read regularly and with great anticipation. Your readers are so thankful for YOU and all that you do! Enjoy your relaxation time, and Happy Thanksgiving! Joan, how neat is this? The joys that grand parenthood must bring! You must be over the moon right now! Congratulations on your family’s addition! Also, I am so glad you enjoy reading the blog. I have found Cozy Mystery readers to be the very best! 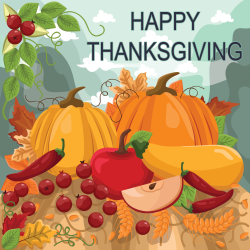 Hi Danna, Happy Thanksgiving to you, your family, and all your readers!! I hope you all have a wonderful day! Danna, I truly appreciate all you do for cozy readers and writers. Your blog is a daily must-read for me. Linda MH, thank you! It’s Cozy Mystery readers like you who make this such a special place for ALL of us! Just back from a glorious Thanksgiving dinner on the Oregon coast. Sunny and 50’degrees. Waves are marvelous. No cooking for us this year and we loved it. Nancy, it’s pretty sweet not to be stuck in the kitchen! Sounds like you had a fantastic day! And nice to see another Kimberley. I spell mine with an ‘e’ as well but abbreviate to Kim for the list so we do not mix up. Our dinner was a success with the Honey Baked smoked turkey but it did not taste the same as the traditional turkey we have enjoyed for decades. I think I prefer the old fashioned, real deal type. I was thinking back to all those Thanksgiving meals that my grandmothers cooked and how I took their hard work for granted. But I do remember now…..funny how that works…if only I could go back and tell them how much I now recall and appreciate. So now it is our turn as grand moms and moms to create memories for the next generation. Off to read my cozy…. Kim, well said! I remember enjoying all of the work my grandmother went through, but (shame on me!) don’t ever remember thanking her for doing it. We all just sat down and enjoyed the fruits of her labor. Danna, I think it’s mutual. You’re thankful for your readers, and your readers are thankful for you. Our hostess. Thankyou for giving us such a great place to go, online! Susan*, thank you for the kind words. I love our little community over here! Your amazing blog & all the information it puts right at my fingertips without my having to do all the research. Thank you so much & don’t ever stop. Carolyn, thank you for the very kind words! I don’t plan on quitting for a long, long time!